Every January kicks off another year of great Illinois fishing adventures. In fact, the Prairie State has so many fishing opportunities, it is often hard to decide not only what fish to target but also where in Illinois you might want to test your angling skills against those fish. Winter is a tough time to be out on the water, but the worst days of winter are perfect for hot sauger fishing on the mighty Mississippi River. Throughout much of the year the fish are widely distributed throughout the river system; however, the fish that migrated upstream to spawn in fall were halted by the several dams on the river, where large numbers stack up and remain there until early spring. Saugers tend to hug the bottom but prefer some type of current break. Look for them in holes and depressions, behind rock pilings or wing dams. Minnows and jigs are the most reliable offerings for saugers. OTHER OPTIONS: Busse Lake Northern Pike: Live minnows are a great choice for targeting these hefty northern pike. Ice-Fishing Bluegills: Where the ice is safe on northern Illinois lakes/ponds, pull a mess of bluegills through a hole usingwax worms or other small live baits. This is a great month to catch a trophy bass at many lakes across Illinois, but the bite is slow on most of them. Hold onto your patience or head to one of several lakes in the state associated with an adjacent powerplant where the water is warm all winter long, and the bite is a lot easier to entice. Forage fish, such as shad, minnows and even sunfish are pulled toward the warmer water at the discharge channel for the powerplant. Largemouth and smallmouth bass also show up to take advantage of the water temperature and feed on the smorgasbord of prey fish. Matching the forage is a great tactic for anglers, but a lot of baits/lures work when the fish are in a feeding mood. OTHER OPTIONS: Lake Michigan Yellow Perch: Fish this early opportunity for perch in any open water along the Lake Michigan shoreline. Cedar Lake Largemouth Bass: Cedar Lake holds one of the best, quality largemouth populations in the state. April is often considered the crappie-fishing month of all months, but there is no reason to sit around and wait for the calendar shift. Get out on Rend Lake this month and take advantage of the early crappie bite, as warming water begins moving fish from their deeper haunts. Brush and other cover located along transition paths provide good early-season papermouth action. Although present in lower numbers than in the past, some nice slabs will be caught. Several years of good crappie reproduction now contribute to the daily catch. White, black and hybrid crappies are present in the population. 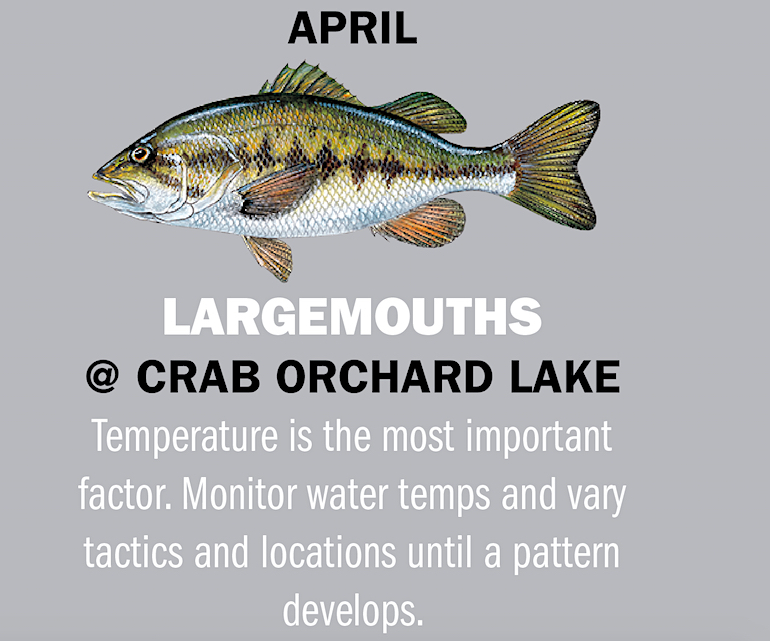 OTHER OPTIONS: Lake of Egypt Largemouth Bass: Locate the warmest areas of the lake to find the most active largemouthsthis month. Fox Chain O’ Lakes Walleyes: Walleyes are becoming active this month, especially early and late in the day, but the action is often decent all day when skies are overcast. Recent fish surveys indicate the number of big largemouths in the fishery at Crab Orchard Lake may have dropped a little, but the overall number of largemouths is still excellent. Habitat enhancements at the lake include installation of fish attractors, vegetation plantings and the establishment of a spawning refuge area with artificial spawning substrates. Changes have been put in place for creel regulations, too, as well as some reduction in the amount of tournament fishing pressure. Look for largemouths to be very active this month and moving onto long, tapered points at the mouths of coves. 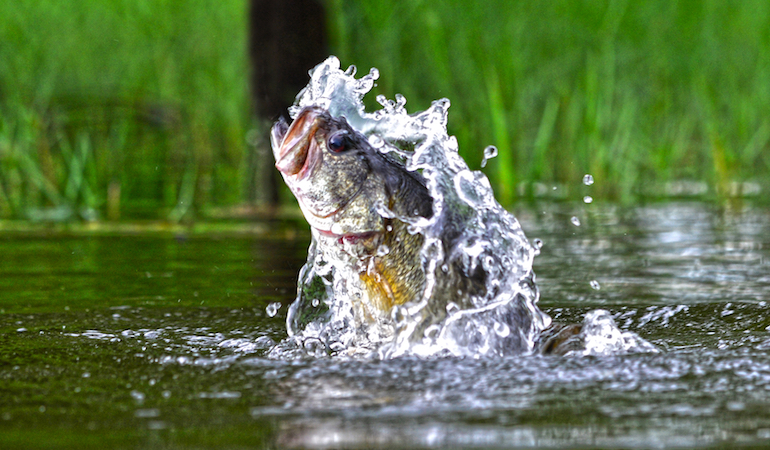 Later in the month, the bass move to shallower secondary points and along shoreline cover. Throw crankbaits, spinnerbaits or plastics to locate feeding fish. OTHER OPTIONS: Lake Shabbona Muskies: Cast shad-imitating baits, spinnerbaits or other big baits to get a hook-up in shallow water. 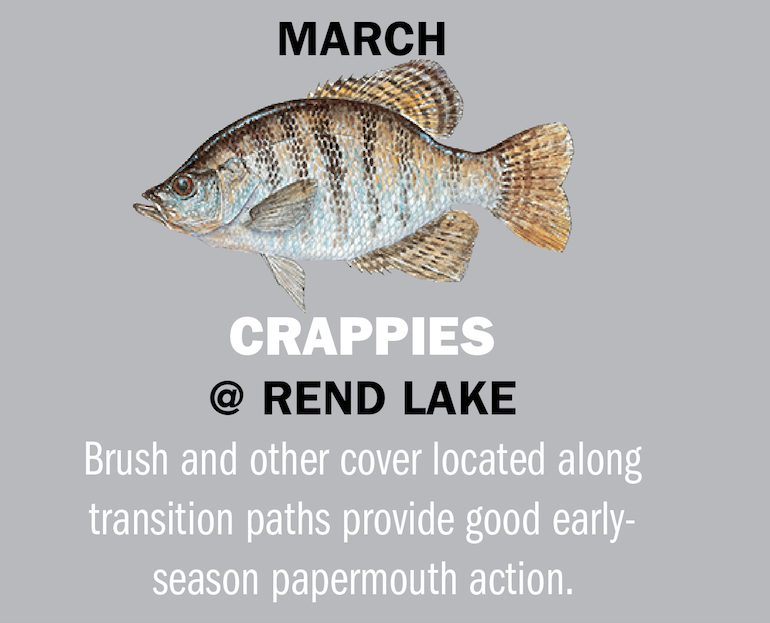 Carlyle Lake Crappies: Black and white crappies keep the action hopping this month for anglerscasting, jigging or drowning minnows. All over Illinois, anglers are stocking up on live bait and brushing the dust off their ultralight fishing gear. This is magic time for panfish! No matter whether fishing live bait under a bobber, casting jigs and other small artificials, or even getting in a little fly-fishing, the action is great all month long. Bluegills are active almost everywhere in the state, while the action for jumbo redears, or shellcrackers, may vary from north to south. Nonetheless, match the right bait with the right tactics for the species, place and time, and the action can be fast and furious! Most all of our lakes produce good bluegill fishing, even local farm ponds. Quality redears are a little less abundant. Warmouths and other sunfish add to the light-tackle excitement. OTHER OPTIONS: Heidecke Lake White Bass: Crankbaits make great search baits early, but later in the month look for surface action. Stocked Waters Rainbow Trout: Take advantage of trout fishing near you. Learn more online at ifishillinois.org/programs/trout_stocking. Because several state fisheries agencies heavily stock hybrid-striped bass in the Ohio River, the population of these hard-fighting game fish stands at very good levels. Individual fish size fluctuates with the availability of forage, but there are plenty of hybrids in the system up to 6 pounds, and larger fish turn up in creels from time to time. The most consistent action takes place in the tailwaters below any of the Ohio River dams, where they congregate to take advantage of the cornucopia of forage fish. Catch ‘em on a wide variety of artificial baits and on “natural” baits, such as chicken liver. Some of the most used lures are the Sassy Shad and Big Hammer swimbaits, but practically anything resembling a shad is a good option when they are feeding. OTHER OPTIONS: Statewide Streams Mixed Creel: This is a great time of year for floating or wet-wading many Illinois streams to catch a variety of fish. Evergreen Lake Saugeyes: Try crankbaits, night crawlers or jigs tipped with minnows to tap into this fantastic population of hefty saugeyes. One of the best spots in the nation for landing a trophy catfish is the Mississippi River. But it is not just for trophy seekers; great numbers of catfish lurk in the big river throughout a wide size range. Whether searching for a trophy blue catfish, the reclusive flathead or a cooler full of fiddler-sized channel cats, the big river fills the bill. Blues and channels turn up most frequently in angler creels. Flathead catfish typically require a little more effort to locate and catch. One of the best locations to find all three species is in the tailwaters below one of the navigation dams. Other good spots are holes and depressions on the bottom — especially scour holes on outside bends of the river — as well as chunk rock, bridge pilings, wingdams and log jams. OTHER OPTIONS: Lake Sangchris Striped Bass: Anglers trolling deep near Striper Point hook-up with a few summer linesides. Clinton Lake Wipers: Look for good surface and sub-surface action this month on hybrids averaging 6 pounds. Some will tip 10 to 15 pounds. Most of the lakes throughout Illinois still offer good daytime bass-fishing action, but August is a great time to be on the water after dark. When the water temperature rises, recreational lake traffic increases, and the bass fishing gets tougher during the day. Many anglers choose to wait until the evening to chase largemouths that feed more comfortably under cover of darkness. Fishing can be phenomenal after dark, plus anglers get a reprieve from the sun and much of the lake traffic. Electronics often play a big part at night. Find bottom humps, grass mats or other features on a graph to pinpoint likely spots to find bass. Slow-roll a large spinnerbait. Jigs, and soft-plastics are sometimes used, too. OTHER OPTIONS: Rend Lake Channel Catfish: Hook into this awesome fishery for channel cats, with an abundance of “fiddlers” present and many upward of 6 pounds. Illinois River White Bass: Throw crankbaits, curly-tailed soft- plastics, inline spinners or minnow-imitating baits. The muskie fishery at Kinkaid Lake in Jackson County is kept in great shape through annual stockings of fingerling muskies. Several quality fish longer than 40 inches are caught every year, with some larger individuals approaching true trophy size. Shad and other prey fish move shallow in the fall, as the water cools with the season’s evenings, and the muskies follow their forage. The Illinois Department of Natural Resources stocks threadfin shad into Kinkaid to provide additional forage that helps its muskies put on the weight and length. Lures that resemble shad are excellent choices for muskies. Other top lures include large spinnerbaits, swimbaits, top-water offerings and some of the baits specifically designed just for muskies. OTHER OPTIONS: Lake Springfield Largemouth Bass: Locate schools of baitfish in shallow water and throw a Big Hammer swimbait or other shad imitation to catch good numbers of hungry largemouths. Rock River Walleyes: The IDNR stocks walleyes into the Rock River every year. Anglers catch plenty of them up to about 6 pounds, with some real dandies anchoring impressive stringers. In lakes all across southern Illinois, the water temperature come October has fallen into the magic zone. Lake traffic is very light, except for the few other anglers. Largemouth and smallmouth bass are congregated in shallow water, feeding heavily as winter “knocks.” Prey fish are schooled up, and bass are taking advantage of the smorgasbord. Smart anglers also take advantage of the situation. The fall bite is often some of the hottest fishing action of the year. Locate schools of shad or other forage and match baits to the prey. Swimbaits, minnow-type lures and crankbaits are some of the most-often used baits during the fall feeding frenzy. OTHER OPTIONS: Stocked Streams Rainbow Trout: Early mornings and overcast days are perfect for trout fishing. Learn more online atifishillinois.org/programs/trout_stocking. Lake Jacksonville White Crappies: Fill the cooler by fishing minnows and jigs in brush piles, stick-ups and other attractors. Muskies are often regarded as one of the most difficult fish to get stuck on the end of a line and with good reason. However, anglers hooking up with them on the Fox Chain O’ Lakes enjoy a higher catch rate than their counterparts on most other muskie lakes. The lake is heavily stocked annually, lending nicely to action not seen on many other Illinois lakes. A lot of the muskies caught are sublegal in length, but they are still a lot of fun to catch. Larger muskies are not caught as frequently, but plenty of them stretch the tape longer than the 48-inch minimum-length limit in the lake. Trolling and casting are both successful in the fall. Spinnerbaits, surface baits and large muskie baits are great options for enticing a bite from one of the Chain’s toothy giants. 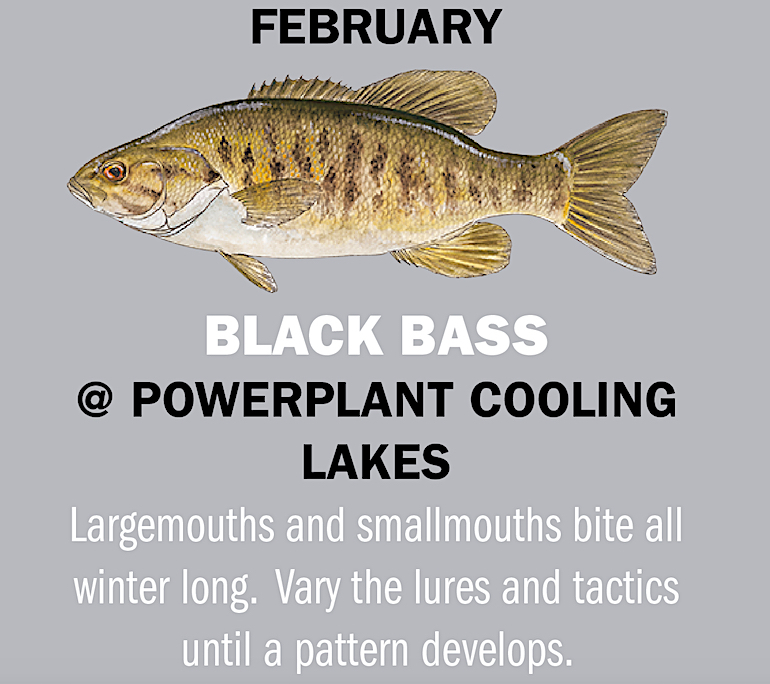 OTHER OPTIONS: Powerton Lake Smallmouths: Look for a good fall bite from the bronzebacks at Powerton Lake this month. Lake Storey Walleyes: Stocking has helped keep the walleye population in good shape, with plenty of individual fish upward of 27 inches long. It may seem odd to some fishermen to consider angling for catfish in wintertime, but the cold months are excellent for hooking into a real trophy. The big blues often find to their liking a hole, depression or other bottom feature, often in the tailwaters below a dam, and literally “hole up” through winter. These fish are lethargic and do not move around a lot. Finding them takes patience and, in most cases, good electronics. The winter bite is much slower than in the warm months, but the opportunity to catch a behemoth is worth the effort. Large chunks of cut shad or skipjack herring are the most-often used baits, but whole chicken breasts and other offerings produce too. 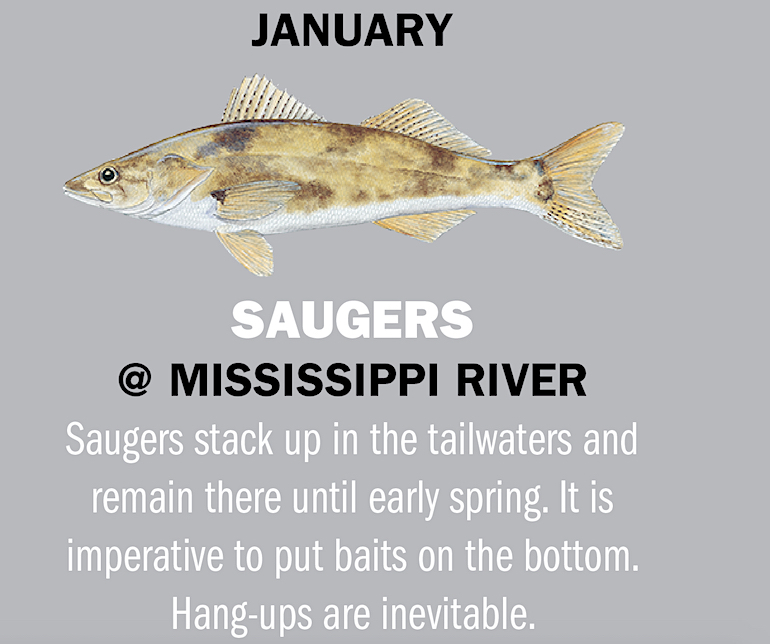 OTHER OPTIONS: Illinois River Saugers: It may be overlooked for some of the larger rivers, but an excellent population of saugers are waiting to be caught in the Illinois River. Lake of Egypt Crappies: Several days of stable weather produce good catches of crappies by tight-lining minnows or jigs in deep brush.